Well friends, here we are. January 16, and we’re officially over halfway through the month! Yep, we are rolling right along! Right now, I am currently huddled up in my apartment underneath a blanket, sipping tea. Because even though it is a mere 20-something degrees outside in NYC, I can’t resist eating my black cherry vanilla nice cream for breakfast! Oh the struggles of winter ice cream enjoyment. The things we put up with for delicious treats, right? Well, anyway tonight I am so excited to share with you one of my most beautiful and delicious recipes! I don’t know about you, but I love Thai flavored things. I remember the first time I had Pad Thai in NYC was with three of my best friends from acting school. They were from Sweden, Brazil, and Austria. And we were eating Thai food. Sounds like the beginning of a bad joke, doesn’t it? Well, it was freaking delicious, and thus began my love of all things Thai! Sooo, this recipe tonight is a nod to those bright and fresh flavors! 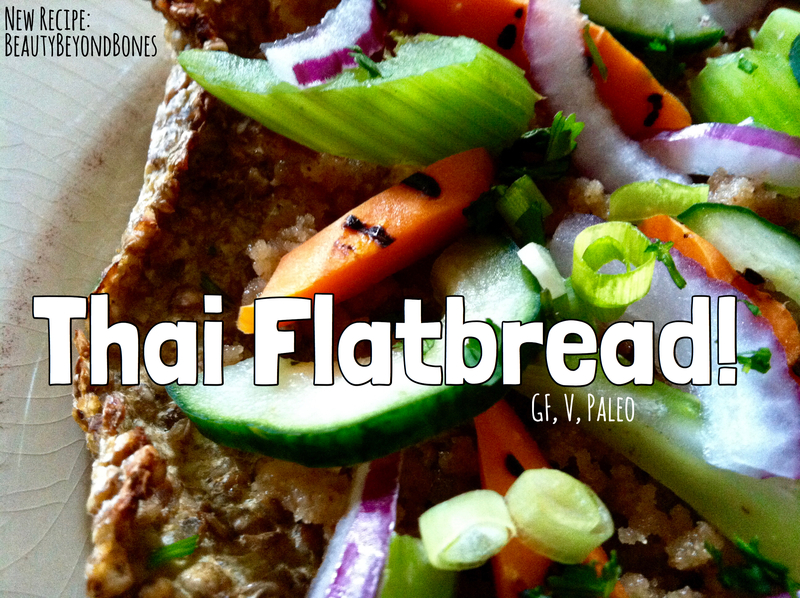 It’s a Thai Flatbread with a Cauliflower and Buckwheat Crust! A creamy almond butter sauce, topped with delicious grilled veggies! And please don’t let the crust scare you — it was phenomenal! Buckwheat, despite its name, is not wheat. It’s a gluten free and grain free seed that acts like a grain! And the amazing thing, is that its packed with protein, as well as other nutrients and fiber! And it’s Gluten Free and Paleo with a Vegan option! Preheat the oven to 400 degrees. Cook the buckwheat, per package directions, until it absorbs all the liquid – about 7 minutes. Fluff with a fork, and then set aside to cool. In the meantime, pulse the cauliflower in the food processor until it resembles rice. Then, put your riced cauliflower in a clean kitchen towel (or several paper towels) and over the sink, wring out all the excess liquid. This is a really important step. Place your wrung-out cauliflower rice in a medium sized bowl. Once the buckwheat is cooled, add it to the bowl with the cauliflower rice, along with the egg whites (or egg substitute of choice) and salt. Mix well to combine into the crust “dough.”. Cut 6 medium squares of parchment paper. Divide the “dough” in 3 even portions. Put 1/3 of the mixture onto 1 square of parchment. Put another square of parchment on top and “smoosh” it out until it forms a thin, round crust. LEAVE THE TOP PAPER ON…it will be like a parchment paper sandwich! Do the same with the other 2 thirds of the “dough.” Then, place the “parchment sandwiches” on baking sheets. Bake for 40 minutes, until golden brown. Then, when you take them out of the oven, the parchment will fall right off! While the crusts are baking, prep your veggies, and combine the sauce ingredients. (It is a thick sauce — more of a “spread” — like almond butter! Also, grill your veggies on a grill pan, 4 minutes per side. Then, take them off the grill pan, and chop into 1 inch pieces. Finally, when the crusts come out of the oven, let them cool for 2-3 minutes, remove the parchment paper, and then top each with 1/3 of the almond butter spread, the veggies, and garnish with cilantro! ENJOY! These little flatbreads blew me away! They were fantastic! It tasted like Pad Thai, in flatbread form! It had flavor, texture, and beauty, all in one delightful dish! First, the flavor! The almond butter spread was so wonderful – it was slightly sweet, and fabulously tangy from the lime and the ginger. It paired beautifully with the fresh veggies, which had a slightly smokey flavor from the grill. Finished off with the bright cilantro — it was just marvelous! And the textures! Oh my goodness, they were outrageous. The crust was unbelievably crunchy, while the almond butter spread was rich and luxuriously creamy. Finally, the veggies were crunchy, but softened ever so slightly from the grill. Lastly, the colors were just phenomenal. It was such a beautiful plate with the different shades of green, orange, and purple. Stunning. And the cauliflower?? You will have NO idea it’s in the crust. I promise! I made this for a couple friends, and they couldn’t believe that cauliflower was the secret ingredient! They devoured their flatbread, and sung its praises! Wherever you are this week, I hope it’s amazing! Stay warm, and happy cooking! That flatbread recipe rocks sister! So is ice cream for breakfast 😆. I make veggie flatbread with Greek extra virgin olive oil all the time, as I do a lot of cooking for my family. The butter sauce is intriguing. My daughter is studyto be a dietitian so we try all sorts of cool recipes like yours! You’re website is a hoot! You’re such a happy warrior! God bless you, keep it up and have a fantastic day in Christ. OK, I’m hooked. I will not be a complete man until I try this. Thanks. Caralyn, this is definitely a dish I will make. It sounds and looks delicious! Fantastic! And I think black cherry ice cream (no added sugar) sounds great for breakfast! Looks super yummy! Also, thanks for the awesome tip for the whitening toothpaste! I totally have to try this out (as well as the flatbread, hehe). Lovely post! Happy 2019! My mouth is watering reading this… and it’s only 6:40am! Going to try this for sure. Thanks! God Bless! Thank you so much Kari! Haha hope you love it! Have an awesome day! God bless! Yum! I love Thai, especially Pad Thai with shrimp. My son loves mussel soup. Come to think of it, I can’t think of a Thai dish I haven’t enjoyed. Hugs! It’s been a good, productive week. Very excited for this weekend, though – Seeing so many friends, participating in a “fun”raiser chili cook-off, and then getting ready for Al’s birthday next weekend. Oh good!! And so fun!! Are you making a pot of chili?! I was always a fan of Cincinnati Skyline Chili — it certainly is a crowd pleaser 😎 have so much fun!! I am! I’m trying a completely new recipe. I’ll have to look up Cincinnati Skyline Chili!! mmm. . . the flatbread looks yummy. I love all thai flavors as well! This looks amazing!